Whether in the coastal regions, aridlands, eastern forests, grassland or wetland habitat, bird populations are in steep decline across North America. Migratory shorebirds, along with grassland birds that migrate from the Great Plains to Mexico, have lost on average almost 70% of their populations since 1970. As we humans continue to use land for our own expansion, the breeding success of birds depends more and more upon our actions and willingness to support them in the urban, suburban and rural landscapes that we maintain around our homes and businesses. A bird-friendly landscape meets all of a bird’s needs: food, shelter, water and nesting habitat. As birds fly overhead, a highly textured landscape sends a signal of abundance, and tells birds that food and safe foraging cover are available. For that reason alone, ‘less lawn’ and ‘more plants’ are the first steps to building better bird habitat. For a bird in search of a nesting place, the classic suburban yard — a tidy square of grass, one or two shade trees, and a foundation planting of invasive exotic plants — is simply a food desert. Each yard like this is one of millions of inhospitable places for them to nest and raise a family. 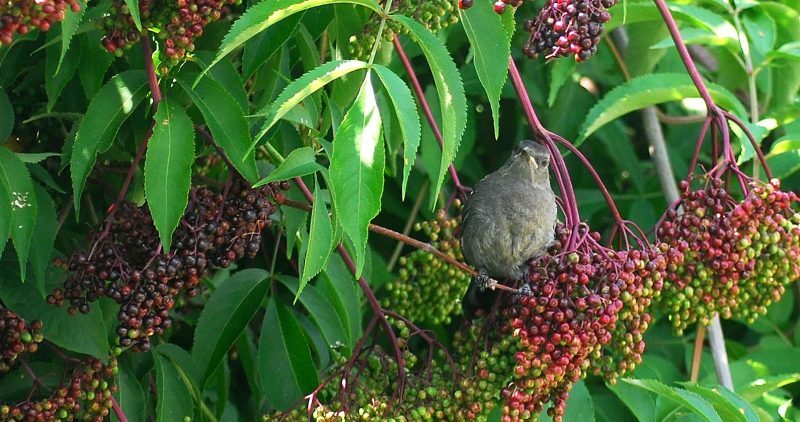 Bird in Elderberry shrub (Sambucus canadensis). Photo by Jim Wohl. 1 – Reduce the Lawn Area. Large expanses of turf lawn are dead-zones because the space is useless in the life cycle of most insects and thus, birds. The addition of native shrubs is a quick and easy way to reduce lawn area, and sends a signal of abundance to birds flying overhead. 2 – Plant Mostly Native Plants. Native plants should be the basis of a bird-friendly yard. The plants help create the dense cover that birds prefer for foraging and perching. Birds seek native plants for the insect they attract, for the seed they produce, and the spent plants are more likely to offer their preferred nesting material as well. Native plants that are indigenous to your area offer are best for increasing biodiversity and supporting birds in a habitat garden. Some local birds will eat from a wide array of plants, berries and insects, while other birds will seek out specific plants and have a more restricted diet. Not all imported plants are bad, but local indigenous species always do a better job when it comes to habitat support. Range maps for each native plant can be found in the image gallery of each the plant species that we offer. 3 – Layered, Dense Vegetation. Some birds forage on the ground for food, while others find food in low shrubbery. Some birds nest in grasses, while others nest in trees. A single bird species will frequently use different heights and layers of vegetation for feeding, roosting and nesting. Dense vegetation shields smaller birds from predators, and is also more suitable for roosting and nesting. Landscapes that include native trees, native shrubs and native perennials are more likely to attract permanent residents, along with transient migratory birds. To accommodate the necessary layering, one large planting area filled with the right plants is better than small beds, widely scattered. Include a wide range of plants, and consider the seasons during which each plant is most useful. Early flowering plants attract insects and provide nectar during the spring, while those with desirable seeds or nuts are essential sources of food in late summer and fall. Include both early fruiting shrubs, such as Elderberry, and later fruit producers such as Viburnums. 5 – Avoid Extensive Pruning. 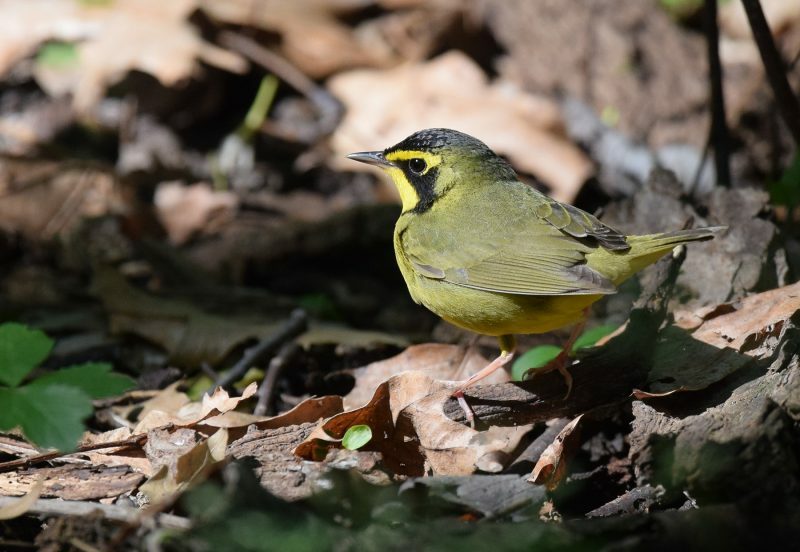 Maintain a habitat landscape with bird behavior in mind. Pruning shrubs and hedgerows, other than to increase fruiting, is not needed for bird habitat. It should especially be avoided in spring and early summer when birds are likely to be nesting there. The protection offered by a hedgerow or thicket is important to their safety and survival. Shrub pruning can always be done during plant dormancy, at the end of winter when the branches are clearly visible. 6 – Leave the Leaves. Don’t over do it on the clean-up! Leaf litter, long grass and brush piles are vital for the insects they harbor, which are so critical for birds survival. Insects are rich in protein and a necessary food for birds, especially as they are raising their young. Encouraging insects in the landscape with dead plant material is an important part of creating better bird habitat. 7 – Leave Plants Standing. Always let your native plants stand through the winter. Both migrants and winter birds rely on the seeds of native perennials. If a tree dies on your property, leave the trunk standing for cavity nesting birds. Branches may need to be removed for safety, but leave the trunk whenever possible. The tall dead tree trunk, known as a ‘snag’ provides the opportunity for nesting cavities, as well as insects. Birds need water for bathing and drinking. Even puddles where rainwater accumulates can attract birds. If you have clay soil, even a shallow hole that fills with rainwater can help. Whether a birdbath, a water feature or ground level puddles, the addition of water in any form will benefit life in the garden. Include water, anyway you can! 9 – Bird-Friendly Garden Care. Avoid insecticide use entirely. It cannot be emphasized enough that insects are critical food sources in the lives of countless birds, amphibians, reptiles, and mammals. Attempting to surpress insects in the garden or landscape destroys the circle of life and creates a degraded eco-system. Choose only natural and organic fertilizers that will not harm birds. Chemical-free gardening is the best approach to gardening – for birds and people alike. However, herbicides are sometimes the best way to combat persistent invasive plants such as buckthorn and honeysuckle. Don’t use them unless absolutely necessary and apply them with the utmost care. 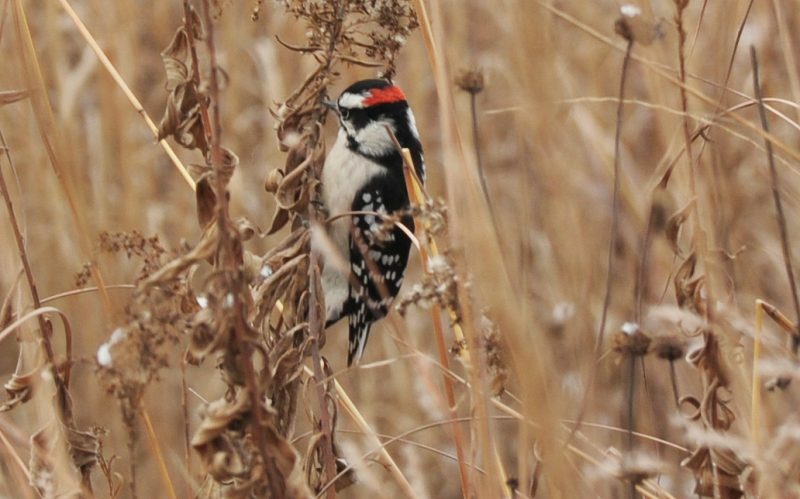 Downy Woodpecker eating Goldenrod galls in winter.